The Oregon Ducks pose with the trophy after beating No. 1 seed Mississippi State to advance to the Final Four on Sunday, March 31, 2019 at the Moda Center in Portland, Oregon. Experts say female sports participation is steadily on the rise in Oregon. Part of the growth of women's sports they attribute to role models at the collegiate and professional levels. PORTLAND, Ore. — From the Oregon Ducks to the Oregon State Beavers, to the Thorns FC and University of Portland soccer teams, young ladies in Oregon can see first-hand what they can be someday. It's inspiration to young local girls who have the ability to attend a women's basketball game at the Moda Center and watch women play at a fast-paced, competitive level. When they can go down to Providence Park and watch the popular Thorns play, it gives them something tangible to aspire to. Moms and dads with young daughters look to the caliber of women's sports in Oregon and beam with pride. Young girls like her daughter, Tavia, are able to watch a high level of play and be inspired. "This weekend was one of those inspirational, aspirational moments for young girls in our community. Really they happen all the time in our state. This was a pinnacle moment yesterday,” Oregon Sports Authority CEO Jim Etzel said. Historically, Oregon has huge success in women's sports on all levels due to tremendous coaching, programs and fans. Etzel says ladies want to play high-level sports here, and that trickles down to the youth. “They see role models, they see girls that maybe come from a similar background as they do and they look at them and they're real, they can reach out and touch them,” Etzel added. Sports gurus say participation rates across girls' youth and high school sports are steady, or gradually inching upwards. Etzel says we’re at the forefront nationally, with an upward trend that’s been climbing for quite some time. Over the last decade or so, Canzano says female sports are bringing out larger crowds as players become more athletic, dynamic, and are shooting and scoring more. 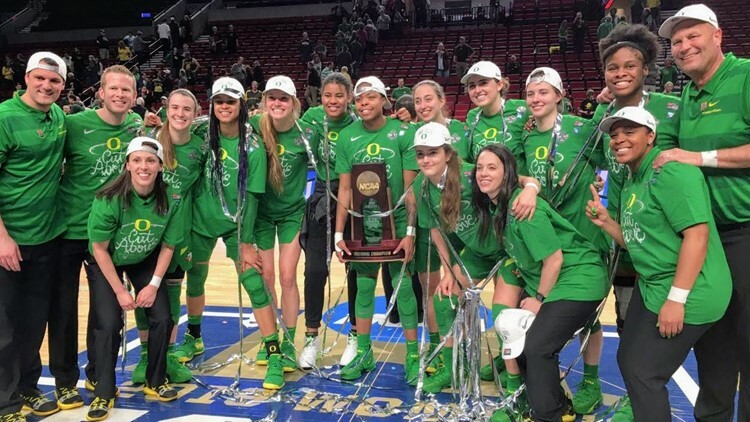 This past weekend's NCAA women’s basketball games in Portland was a shining example, while giving young girls in the crowd people to look up to. “You look through the crowd and all the young girls in the crowd who are looking out onto the court and not only are they just seeing players, they’re seeing female coaches, female officials. It is like a total celebration of women and athletics at the same time. And who couldn’t get behind that,” Canzano said. “The door doesn't need to be opened. The door is wide open. If you're a little girl there are role models in this state playing sports at a high level that you can go watch." Role models for little girls like 4-year-old Tavia. "It means you can do anything you want if you are willing to put in practice and determination. And people believe in you,” Tavia's mom added. The Oregon Sports Authority is launching initiatives over the next couple years centered around underserved girls in the community. Etzel says this college basketball tournament was their launching point for bringing Women in Sports and Events, known as WISE, to the Rose City. It's a national community-oriented organization aimed at getting young girls physically active and staying involved.